Renee Fieldhouse, a member of Phantom Regiment from 1974-1980, sent this picture. The 300 people who attended Phantom Regiment's 50th anniversary party on July 8, 2006, were treated to Phantom Regiment memorabilia which was divided into decades with life-size pop-up artwork like you see in this photo. The "Beginnings" display featured none other than Dr. Dan Richardson, who is Regiment's program advisor, as a marching member in a vintage Phantom uniform. 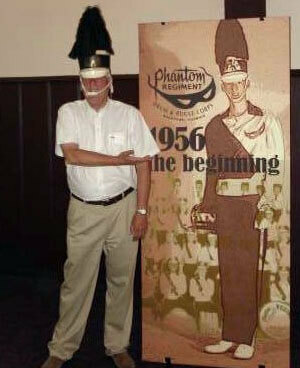 Dan is shown here, complete with shako, at the event next to his image from a few years ago. Everyone loves this photo, Dan!